Are you one of those who just nod at your doctor's prescription and then buy only half of the prescribed medicine from the pharmacist? Or do you belong to that group who promptly buys the complete prescription and stops medications once they start feeling better? Or do you have a common practice of keeping the rest of the medications for a future time either for the same infection or for a similar one? If you do fall in any of the above categories, you have reason to read this! Improper use of antibiotics will lead to resistant strains of bacteria that are life threatening to the future population. 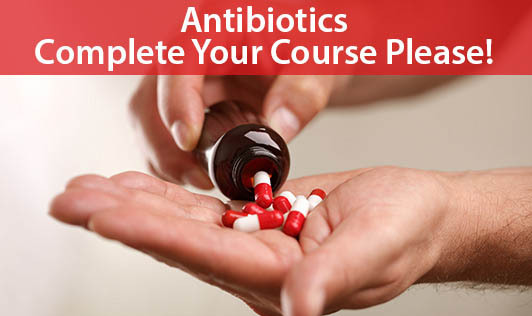 Antibiotics can be prescribed to anyone with a severe bacterial infection. These chemical compounds hamper the mechanisms of bacteria by disrupting the RNA & DNA structures and thus reducing their further multiplication. This means when antibiotics are taken, they should be taken in a complete course. Incomplete dosage of the bacteria will kill only the weaker strains of bacteria leaving the stronger ones to remain, multiply and infect others. This repeated process will eventually result in more and more strains of the bacteria becoming resistant to the antibiotics making it difficult to treat. The common error what most of us do is, we disobey our doctor's prescription to just one or two days instead of three, four or five days course of antibiotics. These numbers are not spell numbers but approximations to clear the infection. Never make a mistake of using antibiotics as over the counter medicines unless prescribed by a doctor.